Since the hook is meant to promote and engage students in developing and asking inquiry questions, it would be most beneficial for small groups of students to look at the hook together. Students should engage in conversation about the quote, pictures, and information presented on the student page. At this time, students should begin viewing the additional websites that are linked on the hook page. This inquiry project should take students through a few to several days of inquiry and fact gathering. Students should visit each of the sites and gather information. Some sites provide more in depth information, pictures, videos, etc., while others provide precise refined information and facts. 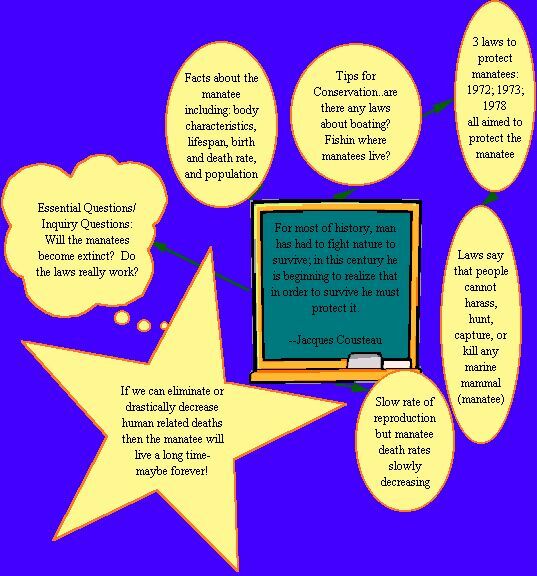 Teachers can promote conversation and inquiry questions by posing questions and redirecting students to the essential questions that are listed below. By taking an active part in the students inquiry and research, the teacher is providing a model and encouragement for good research techniques. In addition, he or she is also relaying the message that indeed this topic is relevant and important. Will or can our conservation efforts get them off the endangered and threatened lists? Have we really learned to protect our sea mammals? Why aren't there any manatees where I live? Vulnerable Species: A species particularly at risk because of low or declining numbers or small range, but not a threatened species. Threatened Species: A species whose population is not yet low enough to be in immediate danger of extinction, but who certainly faces serious problems. If the problems affecting these species aren't resolved, it is probable that the species will become endangered. Endangered Species: A specie, plant or animal, that is in immediate danger or becoming extinct. Its numbers are usually low, and it needs protection in order to survive. Extinct Species: An extinct species is one that is no longer living. These animals no longer exist on the earth. In order for students to answer the questions presented in the hook, or their own inquiry questions, students should take notes in the form of pencil and paper or word processor and create concept maps using the Inspiration software. It may also be beneficial for some students to create and use simple graphic organizers in terms of problem/solution. These can be created by simply diving a sheet of paper into two sections and labeling each section problem or solution. In doing so, students can create a form of visual representation for the manatee population and the steps already taken to solve it. Located below are linked websites that students should visit throughout their inquiry project. These sites provide various information that will eventually lead students to gaining new knowledge and hopefully making educated conclusions about the manatee population. Provided is a description of how students may arrive at conclusions about the past, present, and future of the manatee population. Over the course of several days students will explore the manatee's world as it faces extinction. In order for students to answer the essential inquiry questions they will need to get background information about the manatee. 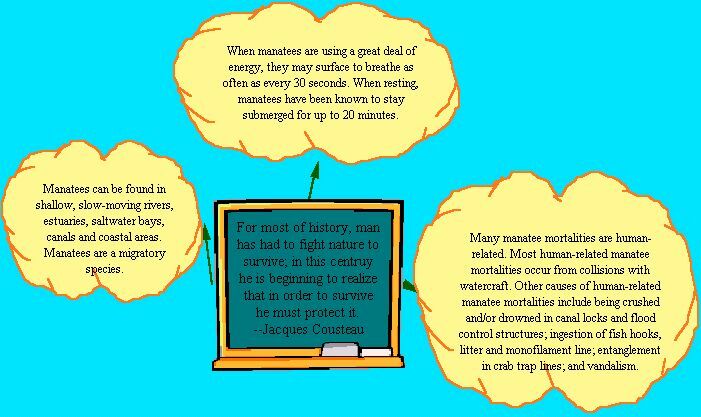 This information can be found by researching factual information presented by the Save the Manatee Club website at www.savethemanatee.org. Here, students will be able to find information about the mortality, population, birth, and reproduction of the manatee. Included below is a first stage concept map as students gather and interpret new data. As it is merely an example it gives brief findings that students may discover during their inquiry. Click anywhere on the image to see a larger version. This site also includes tips for conservation which will eventually lead students to inquire about laws and conservation efforts to aid in the protection of the manatee. Looking at a more refined collection of information about the manatee at www.kidsplanet.org/factsheets/manatee.html, students will be able to again learn facts about the manatee. As students learn and gather new information they may choose to add to an existing concept map, such as the one shown in the example above, or they may choose to start a new concept map for every sight they visit and new inquiry they have. 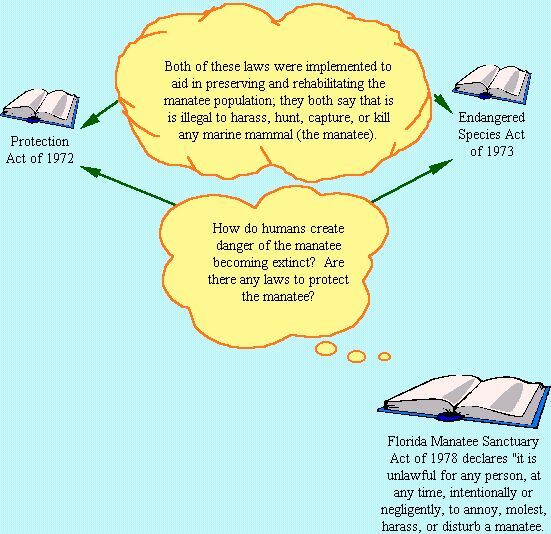 Provided below is an example of a second concept map that was developed by way of questioning the conservation efforts and laws. Located in the center of the map is the main point, or student inquiry. This example shows that the student is engaged in conservation efforts and protection laws and has discovered 3 laws that in fact are in place to aid in the protection of the manatee. By this time students have acquired a multitude of factual information about the manatee. They have begun building a mental concept map and creating or refining a schema about the manatee and its declining population. At this time, students are now ready to create their final concept map- this will be a culmination of information they have learned throughout the inquiry project. For some, it may be beneficial to create and edit a concept map as they go along- this can be done as a brainstorming activity on pencil and paper, a problem/solution graphic organizer, or by using the Inspiration software such as the examples shown above. The concept map seen below was developed using the Kidspiration software program. Moving from left to right beginning with the quote on the chalkboard in the center, the concept map evolves and shows a brief descriptions of developing thoughts and ideas. While the manatee population is still at risk of extinction there are many conservation efforts, acts, and clubs hard at work to save the manatee. From the information provided by the research in the WIP, it is inconclusive at this time whether or not our conservation efforts will indeed provide the manatee with a guaranteed survival. However, some students may come to a conclusion that yes indeed our efforts will in turn protect the manatee, or no our efforts will not be enough and eventually the manatee may become extinct. Whatever the conclusion, students responses and ideas should be valued for each of them has come to a conclusion based on factual evidence, research, and inference. In the example provided below the conclusion is that the manatee should soon be listed as threatened instead of endangered. 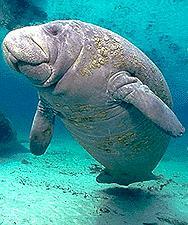 On the facts and myths page we found that the population of manatees has gone up. Reasons for this are actually because of the laws. There have been laws protecting the manatee for over 30 years now and there is less boat traffic in areas where the manatee live. So, even though the numbers of deaths are higher, the percentage of manatees dying is actually lower. Still, a lot of accidents relating to manatee deaths are caused by watercraft. During further research we found that manatees come up for air approximately every 30 seconds (even though they can stay under water for up to 30 minutes) and therefore do not have time to go far from the oceans surface. Using this information we figured out that the manatees are close to the surface a lot of the time and are more in danger of being hit by boats because of it. This is why we think that the manatee will soon be downlisted to threatened rather than endangered. The more awareness and laws that are enforced in an effort to protect the manatee from human related deaths, the more manatees will survive. Are the laws and protection acts really being implemented? Why aren't people more aware of the manatee? How do protection laws get into place? Who makes them? What happens if the manatee does go extinct?